Why: The ASX wanted to make a significant contribution to capturing the history of business and entrepreneurship at the time of Australia’s Bicentennial in 1988. What: A semi-academic history of business, enterprise and entrepreneurship in Australia from 1788-1990. How: Jaqui was commissioned to be a researcher and co-author of the book alongside Prof Max Hartwell, at the time Visiting professor in economic history at the University of Virginia. By the time of publication, Jaqui had established her own corporate publishing business and Champions of Enterprise was her first published book. 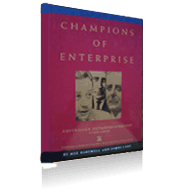 Result: Champions of Enterprise is now out of print and remains one of the main books that explores the history of business and entrepreneurship in Australia. Jaqui is (slowly) working on a revised edition.